To inspire, promote and engage the community in the dynamic new, fun sport of beach tennis. To be creative, passionate and innovative in order to deliver quality events and personal services. Commitment to professionalism and realism, mixed with imagination and dreams, we strive for success. When and where the journey began! It was the year 2000, whilst travelling through Europe and southern Italy Paul Mapley stumbled on a sport that seemed to have the potential to be tribal and perhaps rival beach volleyball in the years ahead. Not only that, beach tennis would surely see a new way of how we can have fun with friends and family at the beach, with a touch of competitive spirit. Since founding beach tennis in Australia Paul Mapley and Kellie de Burgh have embarked on a pioneering yet privileged journey This has now brought the realisation and continual change, to how we have fun on the sand, in Australasia. Most of all it has enabled us to share a love of sport with all our friends. It wasn’t until 2004 when Paul, a professional tennis coach of 20 years, that the hard work began. Paul was looking at new ways to freshen up his players and make tennis funky. Having a successful tennis coaching career and many children with talent. He identified his players seemed to be lacking the drive in tournament play and on the practice courts. It was almost like they needed to have FUN again! Upon asking his kids what they did in the summer months, they replied, we go to the beach and beach houses, and hang out at the beach! So, the up hill journey of beach tennis began in Australia! Although may I say, " We are no less passionate from the day we hit the very first ball"
Beach Tennis was birthed and founded in the Emilia Romagna region in around the early 80’s. The Italians are very responsible for the initiating and moving the sport forward, by initiating regulation and rules, to ensure the integrity and credibility of the sport is maintained. We feel most privileged to be given this opportunity to uphold all the hard work and hours of organisation that the IFBT and Mr. Giandomenico Bellettini have passionately given over the years. Reunion Island (the French team) has come a long way now and the island has many great facilities to play and the quality of players both male and female is very strong. Since 2004, Australian players and members of the Sandflies have supported and played in Reunion, and have continued to improve their game, as some of the best in the world play here. After this day of meeting Bertrand, one could say we were hooked on the sport, the sand and the message of spirit and sportsmanship it has within it. It would see us put together more teams to travel to the World Championships which are held every year in Marina Di Ravenna, Italy on the north-east Adriatic. This is where the best players in the world come to play! In 2005 we sent our first team to Italy, where we finished 5th. In 2006 we formed the ‘sandflies’ the Australian beach tennis team which saw the team gain a podium finish 4th. It was awesome! Go Sandflies!. 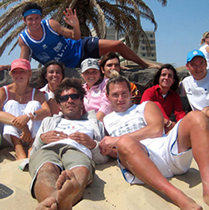 In 2006 the Portuguese joined the beach tennis circuit with their first International beach tennis event. Which was fantastic! In 2008 we were part of another Sandlfies team that took on the world at the World Champs in Italy, only this time there were 12 nations competing more than any other year in the history of the event. Australia came equal third with Brazil, an awesome effort! In 2007, the 1st Australian International Beach Tennis Championships was held in Melbourne. For men, woman, juniors and masters. It truly is a sport for all! It attracted 14 international players from Italy, France and Portugal, and notable inclusions were 3 of the world’s top current players. It was a huge success. It was the first of many! Not only are we building elite players we are working on grassroots level too from 2004 - current we have been involved in many trials and piloting of the sport in Melbourne and around Australia. Come try days and demonstration, were given at no cost for a period of 12 months, in order to launch the sport and place it in the public sphere. The equipment was also tried and tested in order to meet the most difficult conditions that Melbourne could throw at it. With formation of great working relationships with beach volleyball, government, sporting organisations, local surf clubs, local business and the City of Port Phillip, we have seen beach tennis make its mark, and most of all, given an opportunity. Now that the state model has been given the tick, here in Melbourne, a national spread is eminent. With the micro formations to date, in other states, tournaments and formations of clubs will see growth spiral upwards. Beach Tennis Australia primary goals are to inspire, enhance and implement all facets of beach tennis to the wider community. There are many people involved in the journey and support of beach tennis and the future looks bright. As these people are believers of upholding the integrity of the game and the underlying messages of sport and friendships within it, it is in very safe hands. Beach Tennis Australia will endeavour to provide the opportunity for everyone, to play against some of the best players in the world. With the up and coming 7th Australian International Beach Tennis Championships in January, 2013 at Port Melbourne beach, looms again and beach tennis will again witness a great sprinking of local talent and passionate new comers. With the absence of the French Champions in 2012 it gave rise to our own Aussie talent to emerge and take the crowns. Although it was our adopted Aussie the Portugese master Ivo Fonesca staking claim to the Men's Open Singles. In the Girls Open Sinlges it saw a popular winner and Mother of the year effort by Mel Butler, and The womens doubles saw a changing of guard with Betti and Kim, taking it out in a tight tussle. We hope that looking forward, as in 2009 we welcomed 18 international players from France (Reunion Island), to compete against new and up and coming Australian talent. 2009 saw the French rule the sand in the men's, although not without a fight from the Aussies. It would be great to welcome the Frogs and Azzure back here to contest against our very hungry Aussie Men and Women. Go Aussie Boys and Girls! Look out world, we’ve got a few new sghots up our sleeves here in oz! Previously our Australian talent featured current and ex circuit players of the ATP, who have taken a liking to the sport., and are passionate about competing. Like I explained to some young kids the other day. Their is no bigger priviledge than to plan for your country. Since 2010 we have seen a massive increase in the profile of beach tennis where there are now major opportunities each year to play for your country in World Championships and international events, including Italy (August), Reunion, Europe in June, July and Aruba in October and many more. Keep the movement alive and stay strong. In conjunction with many other countries, Beach Tennis Australia will no doubt ensure the sustainabilty of the sport, and the holistic approach we take, which will result in greater participation levels, for all formats of the game. There are many attributes and gains that tennis will see from the sport, but most importantly FUN and fitness and Friends. We call it the “F” Factor! BEACH TENNIS makes all the difference, So can you!